You Asked For It… We Listened… You Got It! Registering for a race early can present challenges when there are changes in our life or our schedules. The Huntsville Marathon now offers a flexible transfer policy that allows you to transfer between races or transfer your entry to another individual. Click here for all the details. DRAWING: Runners qualifying for The Boston Marathon will be entered into a drawing for a TRIP FOR TWO to next year's Boston Marathon! GUARANTEE AVAILABLE TO RUNNERS WHO: (1) Never ran Boston, and (2) Ran within 10 minutes of qualifying on a previous race within the last two years. CASH PRIZES TO OVERALL MALE AND FEMALE WINNERS totaling $15,000! One of the most pristine marathons that Utah has to offer, this course starts in the Monte Cristo area and ends at Huntsville Town Park (Route Map and Elevation Profile) during the peak of our vibrant autumn colors. This course offers a gentle decline in elevation of 3,500 feet from start to finish. Click for more information. Qualify for the Boston Marathon and you will be automatically entered to win a trip for two to the 2020 Boston Marathon! 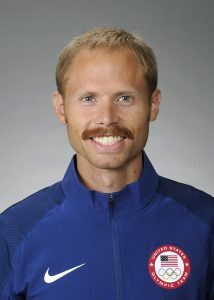 Train for the Huntsville marathon with Olympian Jared Ward! Learn about Endure Strong Online Training. 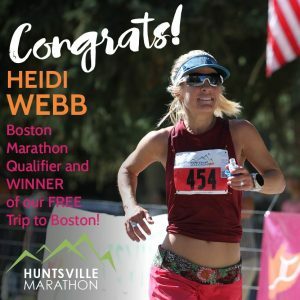 Rated BEST Marathon in Utah by vacationhomerentals.com (a TripAdvisor company). Average historical 9 AM temperature is 50 degrees. Average historical afternoon temperature on race day is 71 degrees.